Washington lags behind neighboring states in protecting our waters from the harmful impacts of suction dredge mining. However, the Washington State Legislature is currently considering SB 5322, which would ban suction dredge mining in critical habitat and provide Washington Department of Ecology oversight for Clean Water Act compliance for suction dredge mining. Your help is needed, please contact your Washington State representatives and urge them to enact common sense protections for native fish populations and clean water by voting YES on SB 5322. 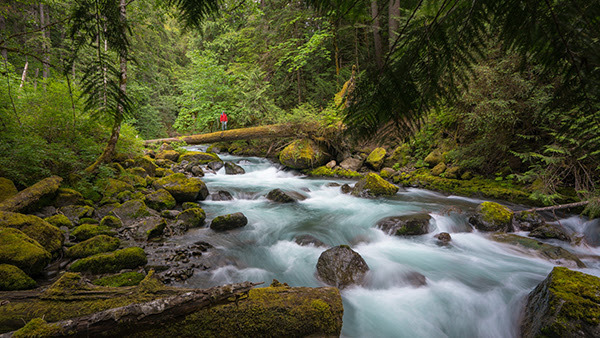 Throughout the Gifford Pinchot National Forest there is a network of rivers and streams that provide clean water for communities, fish habitat, and recreation. The Wind, Cispus, Lewis, White Salmon, and the other seemingly endless rivers and tributaries inescapably intertwine clean water with the health of the forest. Clean water is also the foundation of healthy salmon populations. Each year hundreds of millions are spent in an effort to rehabilitate salmonid populations through projects that restore habitat, improve stream shading, and remove barriers to fish passage. Suction dredge mining can undo these efforts in an instant. April is Riparian Planting Month! In partnership with the US Forest Service, CFC is continuing to embark on riparian restoration throughout the Gifford Pinchot National Forest. With the help of volunteers, we planted over 2,500 cottonwoods, willows, western redcedars, and Douglas-firs over the past two years. 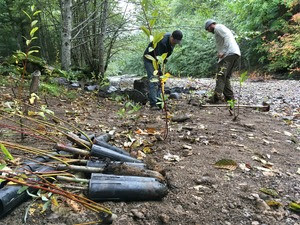 The trees were planted along riparian areas that were lacking trees, lacking tree diversity, and/or had unstable banks. Trees were also planted as forage in areas that could be future habitat to the beavers we release as a part of our Beaver Reineoduction Project. This year, we hope to get our the number of trees planted well in the thousands. For this year’s planting efforts, CFC will be leading three trips to the national forest in April. April is an ideal time to plant because the ground is saturated from melting snow and there will be many days of rain. The wet conditions will help the trees settle into the ground after they are planted.Our first trip will be an overnight trip from April 13th-14th where we will plant native trees along Trout Creek, a tributary of Wind River. 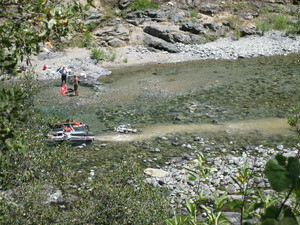 Trout Creek is home to the threatened salmon species, Lower Columbia River Steelhead. Ten years ago, Hemlock Dam was removed from the creek to improve passage for the threatened steelhead and to enhance aquatic conditions. Now CFC and volunteers are going to help further restore the area by planting hundreds of seedlings. On April 20th, in honor of Earth Day, a one-day planting trip will occur in the Cipsus River Valley to continue our planting work along Yellowjacket Creek and North Fork Cispus. On April 27th, we are partnering with Lower Columbia Fish Enhancement Group to plant along the South Fork Toutle River to help them with their goal of extending the range of usable habitat for Chinook as well as diversify existing steelhead and coho habitat. https://cascadeforest.org/trip-signup/ to sign up for a trip! Before the screening there will be a short reception with food and drink, and a raffle. See you there!